Keep essentials close at hand, wherever your travels take you, with this Perfect Office-to-Go. 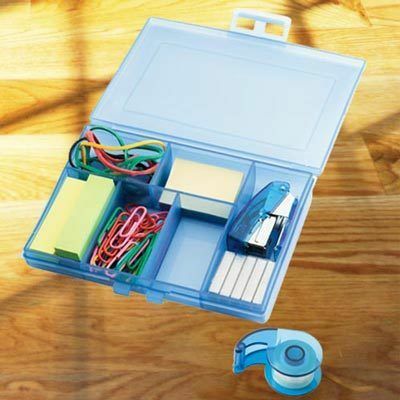 Sturdy blue box holds everything you need: stapler and staples, tape dispenser, post-it pad, post-it tabs, rubber bands and clips. 5"w. Hurry! Quantities are limited! Great to take in purse, briefcase or in glove box.